and also because of changes in climate, in the frequency of forest fires and destructive insect epidemics. A continental glacier covers the Quebec province. 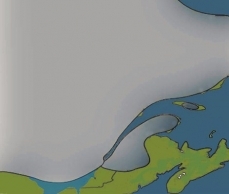 12,500 years ago, Quebec was covered by an enormous continental glacier, an ice sheet. and glacial waters from the Champlain Sea coursed toward the Atlantic. This climate prevented trees from establishing in eastern Quebec. Only shrubs were present. The region was a herbaceous tundra like that found in arctic or alpine regions. 10,000 years ago, the melting waters of the Laurentide ice sheet created Lake Barlow, in Témiscamingue. The summer was mild there. Several thermophilic trees took advantage of this microclimate. Near Lake Témiscamingue, there are still visible vestiges of this original combination of plants. South of Mont Tremblant, in the Outaouais region and in mid-Mauricie, the cold, dry climate contributed to frequent fires. Aspen groves survived there, thanks to fires that kept competition in line. A thousand years later, they were supplanted by black spruce. 9,000 years ago, Sugar maple-yellow birch groves took roots in southern Quebec. They took advantage of the withdrawal of Lake Laflamme's waters to colonize lands in Lac Saint-Jean. Populations of sugar maples survive to this day in the region. At the same time, lands south of the glacier were invaded by several trees and shrubs. It closely resembles the composition of today's boreal forest. 6,000 years ago, the ice had almost entirely shifted away. The summer climate was a bit warmer than it is today. There were more trees and shrubs in this shrub taiga than in contemporary taiga. 5,500 years ago, hemlock was abundant in Montreal. Until a phenomenal butterfly infestation decimated almost all hemlock stands in eastern North America simultaneously. 4,000 years ago, Quebec is finally freed from the ice sheet. At that time, thuya were abundant in Abitibi-Témiscamingue. The gradual increase in forest fires over the years caused these cedar-fir stands to virtually disappear. 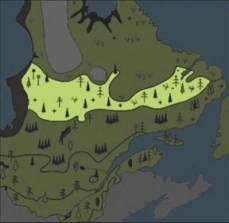 So, the current shape of Quebec's forest ecosystems is only a couple of thousand years old.